NEW DELHI, India (CNN) -- Indian Prime Minister Manmohan Singh appeared set for a second term as his Congress party and its allies scored a decisive lead over their opponents on Saturday in a vote count after the country's monthlong general elections. Congress supporters in Banglaore Saturday celebrate the party's lead in election results. The Congress-led United Progressive Alliance surged ahead in more than 255 of the 543 federal parliamentary boroughs, outpacing the main opposition composed of a grouping led by the Hindu nationalist Bharatiya Janata party (BJP). BJP leader Arun Jaitley conceded defeat, stating that the ruling party will win the election. "We respect this mandate and accept it," Jaitley said. India's communists, who last year parted ways with the federal government for its civilian nuclear cooperation agreement with the United States, also suffered a massive blow in their stronghold state of West Bengal as they trailed their rivals in more than half of its boroughs. Singh drove down to the home of Sonia Gandhi, the Italian-born head of the Congress party, after trends gave out a clear mandate in favor of the ruling coalition. Standing beside Gandhi, who once again endorsed the choice of Singh for her party's top job, he thanked voters for their support. He vowed to maintain a stable government that he said would remain committed to secular values. Singh also remarked that he would like Rahul Gandhi, son of his party chief, to become a member of his new Cabinet. Deepak Sandhu, the prime minister's spokeswoman, told CNN that Singh is expected to hold a meeting of his current Cabinet on Monday. The prime minister, whose coalition may need some extra backing to be able to reclaim power with a majority of 272 lawmakers on its side, threw up an invitation to all secular parties to come and support his government. 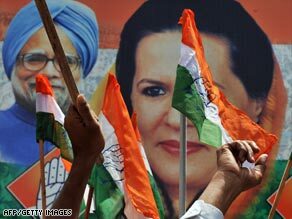 The fifth and final phase of India's marathon general election to choose a federal government ended Wednesday. Most of the results of the will be out by the end of the day, election officials said. India is home to about 714 million voters. About 100 million voters registered for Wednesday's polling.